The last week of one-on-one games, and the winning player has been determined! The Loyalists also managed to win another week, meaning the the Rebels will have their work cut out to win a big enough victory in the finale next week. First up was a magic-shenanigans-heavy game (look at all those psychic cards!) 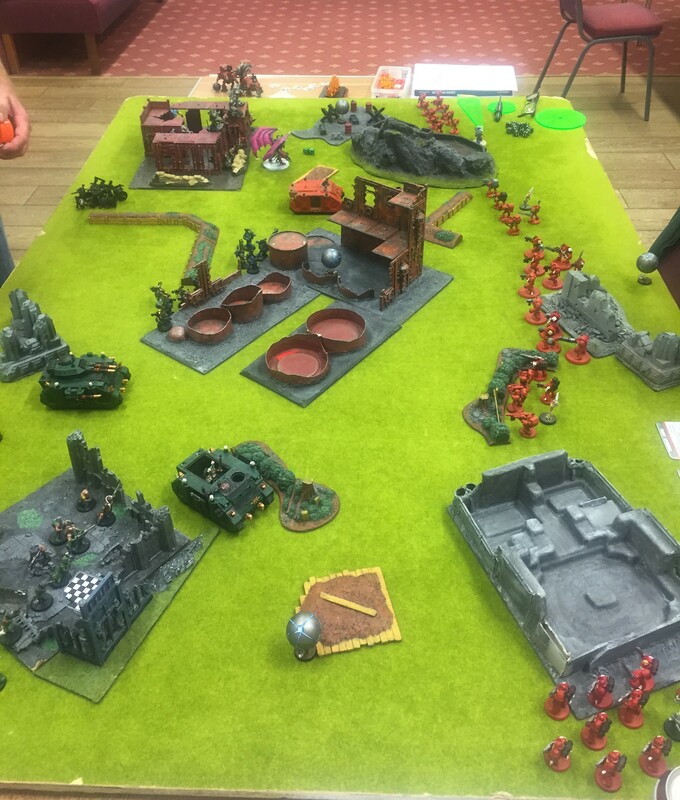 between Mo’s Chaos and Bob’s Exorcists (with some Grey Knight allies) in an Ambush game. 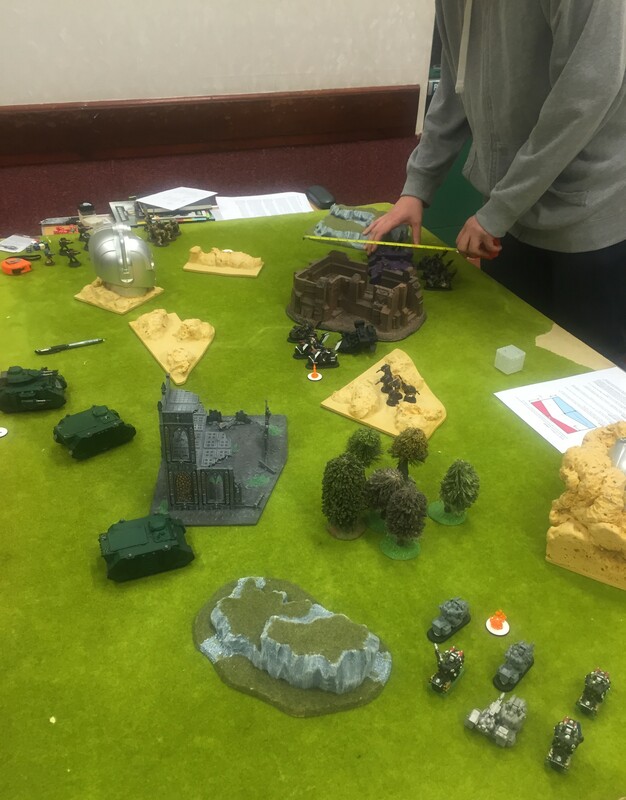 Through bloody struggle, the forces managed a draw! Next up, Dave’s Chaos fought Brychan’s Blood Angels in an All Along The Watchtowers game, which in the end came down to Dave’s forces being about a gnat’s whisker away from securing the primary objective, thus ending in the first draw of the evening (and the campaign – they finished before Mo & Bob’s draw). The third game was another Watchtower, between Paul N’ Guard and Alex’s Tyranids. 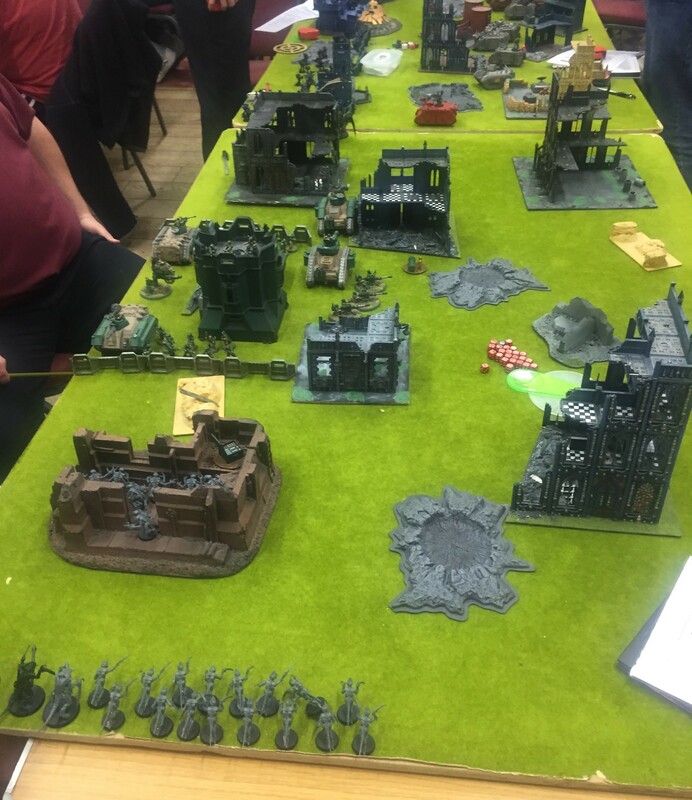 Despite some cunning outflanking-the-outflankers tactics from Paul, the sheer numbers of ‘Nids combined with the plethora of LoS-blocking terrain which was hampering Paul’s attempt to shoot the big ‘uns proved too much in the end. A win for the Rebels. The fourth game of the evening seems to have eluded my camera (sorry! ), but was a Heat of Battle between Paul B’s Crimson Fists and Andrew’s Iron Warriors. Going first, Paul concentrated on eliminating one of Andrew’s Vindicators, else he’d have to witness the firepower of this fully armed and operational battle stat… urm, I mean, the firepower of a full Vindicator squadron (being as they get a bonus if all three fire at once). With his last shooting attack, Pedro Cantor called down the might of his own Strike Cruiser to finish the job (never send a boy to do the job of a four-kilometer-long starship), saving his lads from uncertain death. Ended with a close win (5 points to 4) for Paul, securing his place in the leaderboard (see below). 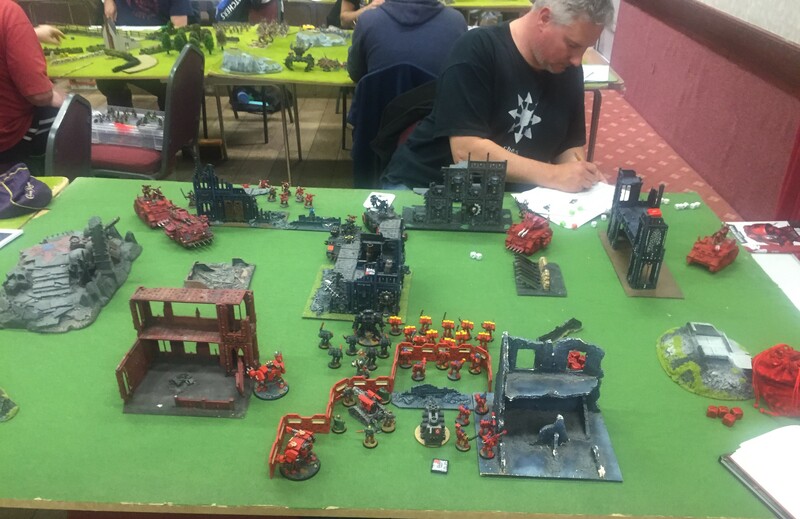 The last game was another Ambush game, this time between myself and Ben, both using Dark Angels (always up to something, those green space marines). Despite my best efforts, my warlord and his terminator buddies got easily whittled down after being blocked in by Ben’s Rhinos. 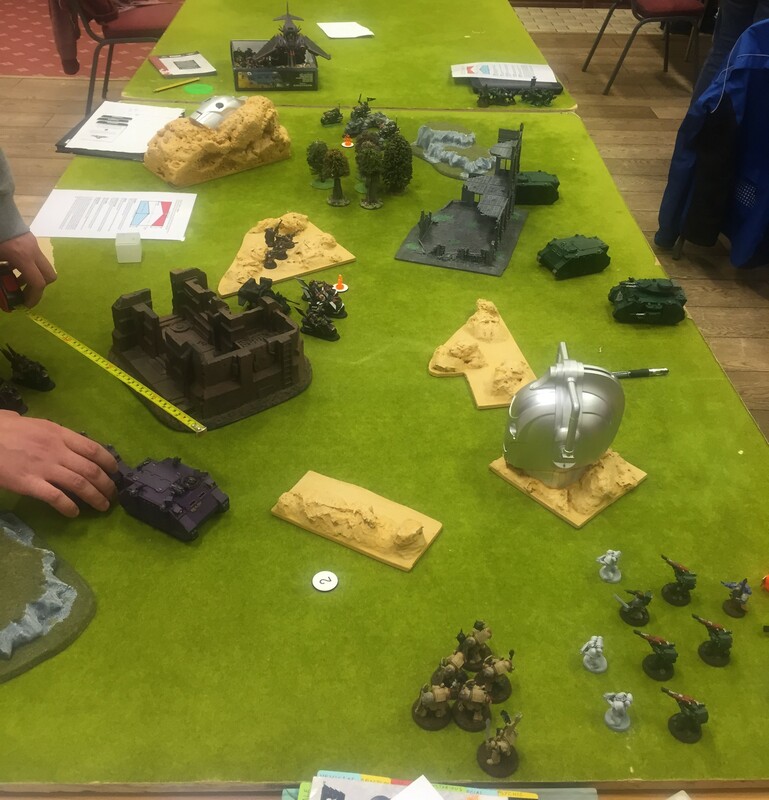 Unable to land a decent hit against the vehicles, my Company Master ended up in a challenge against Ben’s Company Master, whereupon Ben’s Monster Slayer (a relic sword with a random statline) powered up fully (giving it Instant Death). A single wound got through my armour (those darn 1’s! ), turning my warlord into a fond memory. 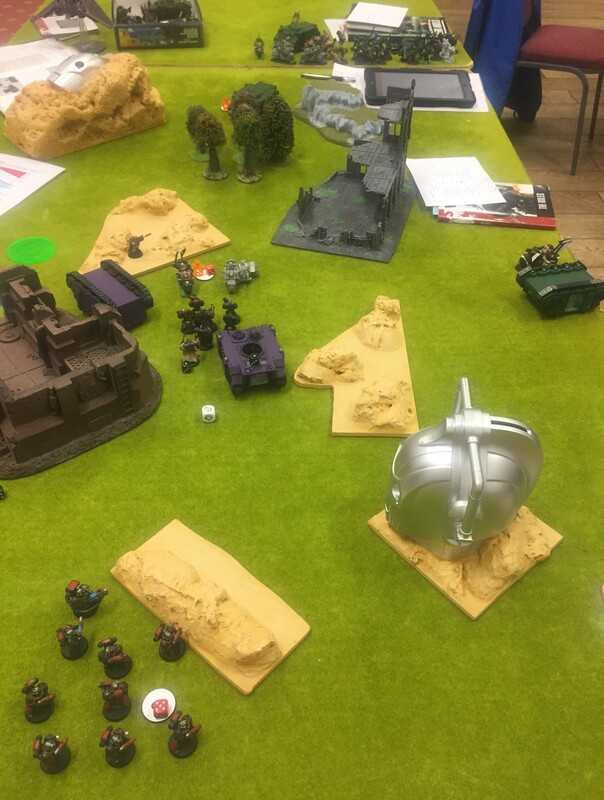 Also notable was my Ravenwing’s multiple failed attempts to charge Ben’s Scouts – apparently being within 2″ isn’t enough when charging through terrain! I managed a decent number of victory points, considering I had less than a handful of models remaining, but was fairly beaten 5 points to 7. Another Loyalist victory! Loyalists: Amulet of the North Star – Your Warlord may re-roll the Deny the Witch test against Witchfires & Maledictions targeted at his / her unit. Revolutionists: Porcum-skin Mantle – Whenever your Warlord suffers an unsaved wound that would cause Instant Death, he or she loses 2 wounds instead of being reduced to 0 (Feel No Pain rolls are still not allowed). Whenever your Warlord suffers a Penetrating hit, the attacker rolls two dice on the Vehicle Damage Table and applies the lowest result. Here’s the leaderboard at the finish. Well done Paul B! 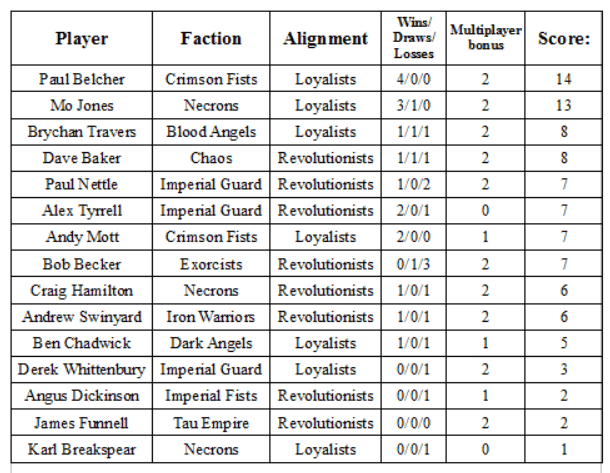 Here are the list-building rules for the final showdown: Follow the Allied Detachment Force Organization Chart (shown below), with the addition of up to 1 Loard of War slot, and up to 1 Fortification slot (the points restriction on LoW in place for the one-on-one games is not in effect for the showdown). Ignore the restriction on Warlords, obey the restriction that all models must have the same Faction (or no faction). Troops are still Objective Secured, but it will have a lesser impact on the game than normal. 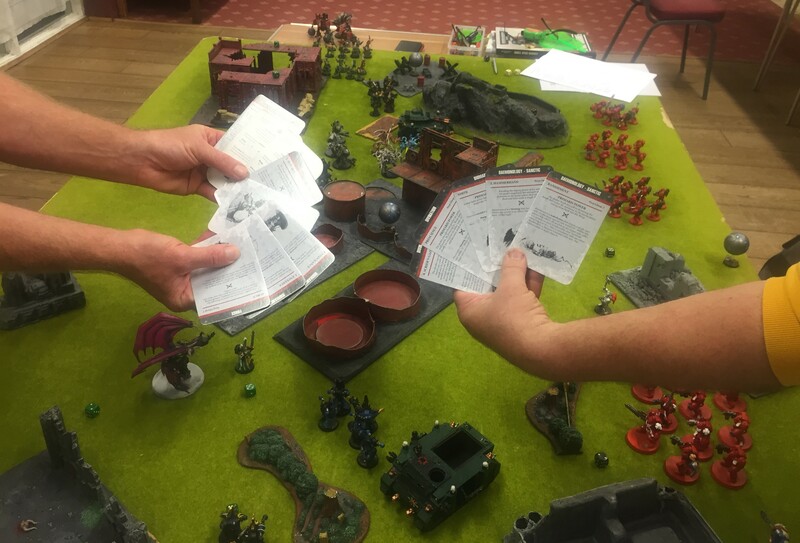 Loyalists: You have 750 points to spend, but please bring an additional 250 ish points in case I need to balance the sides. Revolutionists: You have 700 points to spend, and also please bring an additional 250 ish points in case I need to balance the sides. Any questions, please do ask!